Check the petition papers to see if an answer form is included. Courts typically have preset forms for answers to divorce petitions, and the form might have been mailed with the papers. Check the petition for the deadline by which you must file your answer. Contact the court if no answer form was included with the petition papers. Ask for an answer form and court instructions. State what you disagree with on the petition and why on the answer form. Follow the court instructions regarding formatting and word usage. For example, you may simply have to use "admit" for allegations you agree to and "deny" for items you don't, with facts supporting the denials. Carefully review the petition while preparing the answer form to avoid forgetting important issues. Bring the written answer form and your photo identification to a notary public. 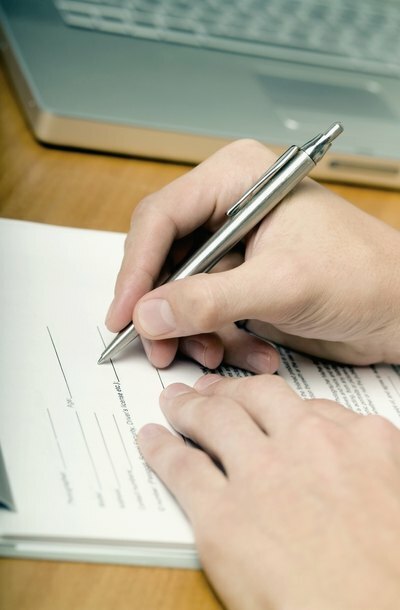 Sign and date the form in front of the notary and have the signature notarized. A notary public is typically available at government buildings and banks. Make at least two copies of the notarized answer. Bring the answer and copies to the court where the petition was filed. File the answer, and pay any required fee. Ask the court how you must send notice of the answer to the other party. Court requirements vary by jurisdiction; you might have to send a copy of the answer by certified mail or regular mail, or you might have to have the document personally served on the other party. Maricopa Superior Court: What Happens if the Respondent Files an Answer or Response?